CLICK BELOW TO LISTEN TO THE BLOGCAST OF THIS POST. In my previous two articles, I discussed how to grow a construction business by (PART 1) using the margin required for your business to determine your markup and (PART 2) tracking your labor costs using billing codes. In part 3 of this series for Fine Homebuilding.com, I outlined a method to analyse the data that you are tracking. I refer to this method as the Gravity versus Frequency Reporting Summary. The GRAVITY of a report is inversely proportional to the FREQUENCY at which that report is reviewed. …the more often you review a report, the less weight it carries; the less often you review a report, the more weight it carries. The GRAVITY VS. FREQUENCY REPORTING METHOD allows you to establish a systematic review of your business’ performance on a weekly, monthly, quarterly, and yearly basis. WEEKLY REPORTS will define the ACTIONS you are taking to drive the day to day operations of your business. 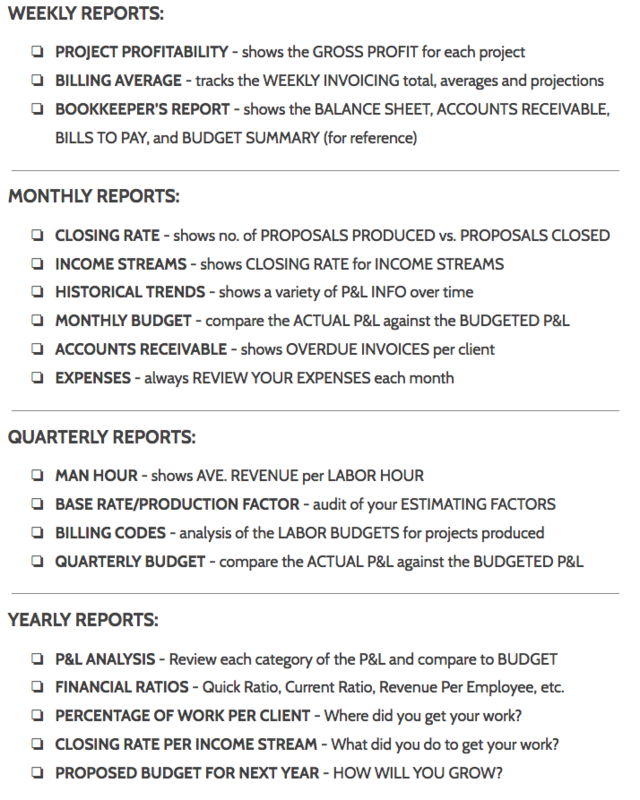 MONTHLY REPORTS will identify the TRENDS that occur during the regular cycle(s) of your business. QUARTERLY REPORTS will track the progress you are making toward your GOALS. YEARLY REPORTS will help you determine if you are accomplishing the MISSION of your construction business. Let’s take a look at how these reports feed into one another. The Average Weekly Billing (AWB) number is one of the metrics that you should be tracking each week. AWB is simply the Total Revenue Projection for the year divided by the number of weeks in a year. 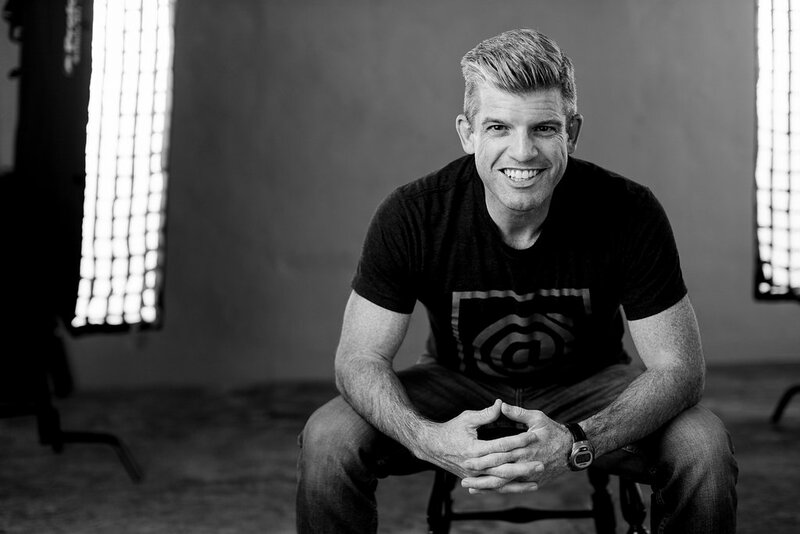 If you project that you need to have a Total Revenue of $1,000,000 in order to achieve your overall business goals for the year, then the AWB for that goal would be $19,230. If you don’t produce and invoice at least an average of $19,230 each week for the entire year, then you will not achieve your income goal. But the gravity (or weight) this number carries is not as critical as other metrics in this report because you are analysing this number each week. If you fall short of this number in any given week, you have the next week and the following weeks to make changes in your production, estimating, or other lead indicators that control this weekly number. This metric carries less weight. Contrast this metric to a metric that you will be analysing only once per month, such as Monthly Budget. The Monthly Budget carries more weight than the AWB because you are analysing the Monthly Budget less frequently. There are only twelve opportunities in a year to adjust the monthly budget numbers. But the Monthly Budget analysis doesn’t carry as much weight as the Quarterly Budget. Since you are looking at the Quarterly Budget only 4 times per year, the information contained in this report is very important to the operation of your business. And the most important report of all is the Yearly Report. Not only do these reports tell you what you did the previous year, they help set the goals for the upcoming year. Below is the Gravity vs. Frequency Report Summary. Having access to the important information that drives your business’ performance is vital to the long-term success of your business. You must also know WHICH data to analyse and HOW OFTEN to review this data in order to make the decisions necessary to drive your business. Use this method of reporting to prioritize the flow of information within your construction business so that you can plan for your short-term and long-term success. When you are clear on the ACTIONS (Weekly Reports) that drive your business, you will be able to spot the TRENDS (Monthly Reports) that occur in your business. When you can predict the TRENDS in your business, you will be able to achieve your GOALS (Quarterly Reports) in a more consistent manner. And when you consistently reach or exceed your GOALS, then you will be able to accomplish your MISSION (Yearly Report) and grow your construction business. Thanks for taking the time to read this article. I really appreciate and value your time. Please leave a comment below and let me know if you agree, disagree, or have any questions about this topic. 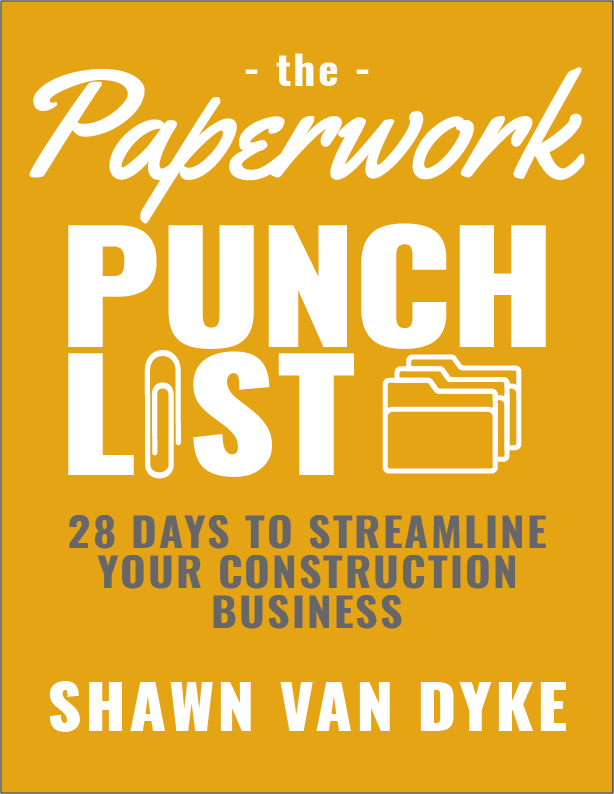 Follow me on YouTube, Instagram @shawnvandyke, LinkedIn, Facebook, or shawnvandyke.com to learn more about how to streamline your construction business.